Bob Lopker is a Boca Raton-based insurance broker for Insurance of America. Understanding that home and condominium insurance isn’t the most exciting product, yet anxious to stand out among the competition, Bob contacted Keenability to help him establish a customized brand for his team, while still meeting specific guidelines set by IOA. This new branding project would also help kick-off a direct mail farming campaign aimed at a targeted list of local condo association members. Keenability’s designers worked closely with Bob to establish a distinctive logo to invoke trust, featuring a stylized shield icon and serif font. The color palette came from IOA’s own branded blue and red. The entire logo suite featuring horizontal and vertical orientations ready for use in print or digital media was delivered to Bob as soon as final approval was secured. 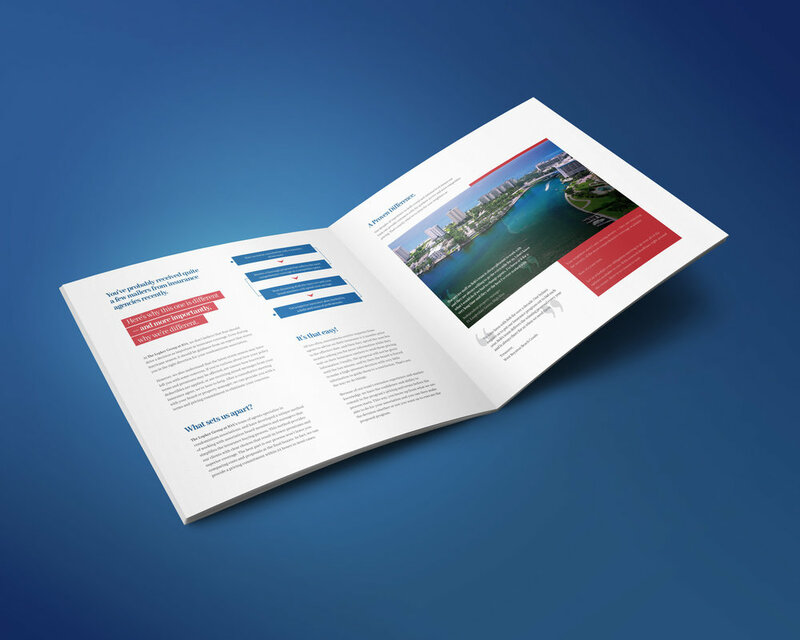 Eager to get his new logo in front of his audience, Bob contracted Keenability to devise a strategic direct mail campaign making use of a mailing list he’d secured featuring hundreds of condominium association members spread throughout the east and west Boca Raton area. Rather than utilize a standard postcard, and also happy to show off the updated branding, we elected to produce the first piece as a full-sized bifold featuring relevant stats regarding local insurance facts, claims, and highlighting Bob’s experience and unique selling proposition. The large, bold “Hello board member,” helped ensure the recipient knew this was meant specifically for them. This initial send was promptly followed up by a second one designed to encourage appointments and inspired the client himself. An avid football fan, this creative piece mimicked a football ticket, complete with a tear-off bottom section for the potential customer to write down their quote appointment date and time and keep handy. The campaign was a success, as phones began to ring, appointments were set, and Bob and the Lopker Group securing multiple new clients.